I received my KIT TY DIY tree today and it went up in a snap--great directions and so easy to put up. Our cats weren't quite sure about the tree but here is a photo of three of them (we have others too shy at the moment) checking it out! Love, love, love the tree! 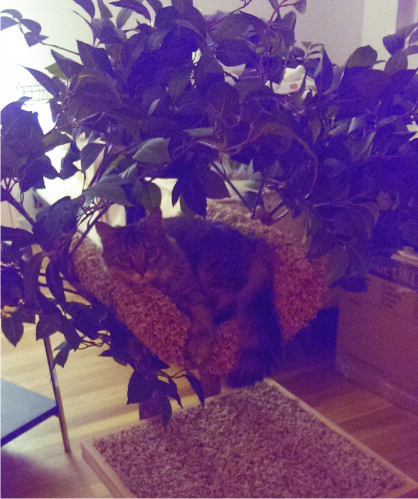 Here are some pictures of Noah and Bella enjoying their new tree (Though mostly Noah since he has claimed it). Noah practically lives in it! I'm so happy we decided to add the cradle to the top because that is his favorite spot. He occasionally allows Bella to enjoy it but for the most part it is Noah's and he has given the small tree to Bella. Bella is a 16.5yr Siamese and Noah is a 9yr DMH orange and white. I'm just thrilled we found your company. Thank you for such an excellent product! I wanted to thank you for the beautiful hand crafted tree. 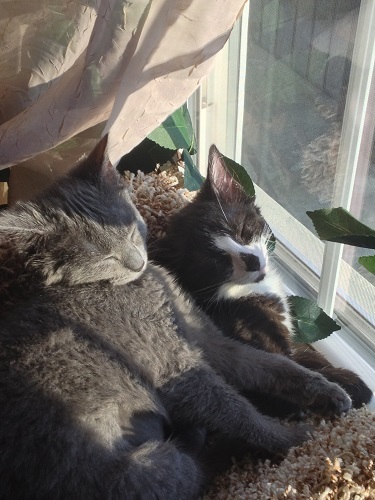 As you can see by the pictures attached our two little kitties (Bruno, is the brown cat and Riley, the black & white little guy) are loving their new tree. Thank you again! 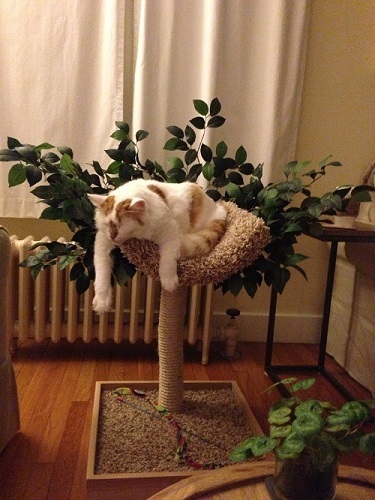 I'll definitely recommend your cat tree's to my fellow cat lover friends. I just moved into my apartment yesterday. I was busy unpacking my clothes and other household items all day. It was getting late, but I decided to unpack the pet tree. I was a little skeptical at first, thinking my cat might not like it, because she doesn't climb around too much. I was wrong! Within minutes of taking it out of the box and attaching the foliage, she immediately went over and jumped up to the top perch. 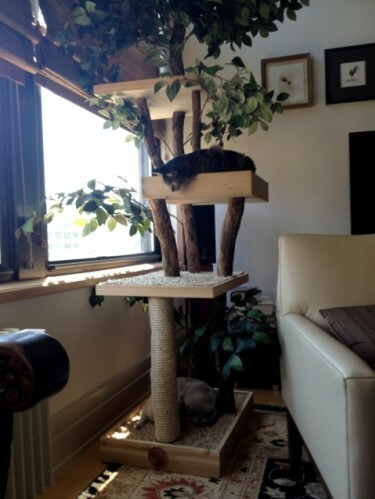 She enjoyed it so much she decided to sleep in her new tree instead of my bed last night! Thanks so much. Here is a pic! 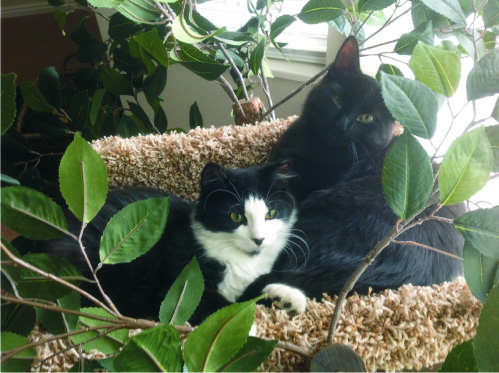 Cosmo and Zola love their Tree House! We have received the tree and are very pleased. It is beautifully constructed, as advertised, and our two apartment dwelling kitties agree! Max and Trixie were a bit wary at first of this large new stranger, but they got over their fears and have been enjoying (yet another) place to hang. Not that they are giving up all their OTHER hangouts (bed, counters, top of armoire, top of husband's shoulders, couch, etc. ), but I was especially pleased to see Max use the scratching post. Attached are pics of Max (the Tonkinese) and Trixie (brown tabby) laying claim to their new dwelling. We haven't sent pictures in a while. Here are a few shots over the months of Nuri in his treehouse. He goes up every day. From about 8 am until 1 pm he sleeps at the very top. The cats really enjoy it, and it continues to look exactly as it did the day we got it. Thanks again for such a great piece of cat furniture. 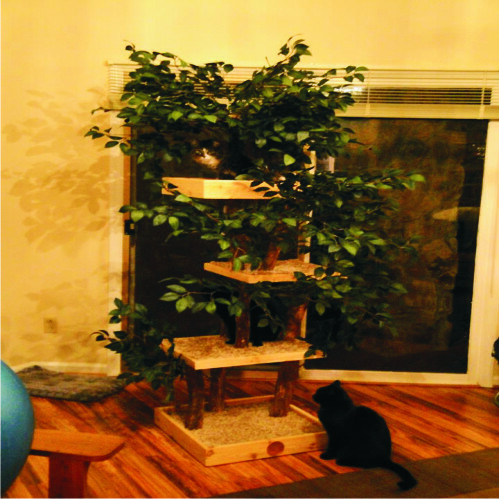 Here are some pictures of the cats enjoying their new nesting tree! Bella (the siamese) was only able to use it once before Noah (orange and white) claimed it as his exclusive Throne. He is literally obsessed with it! 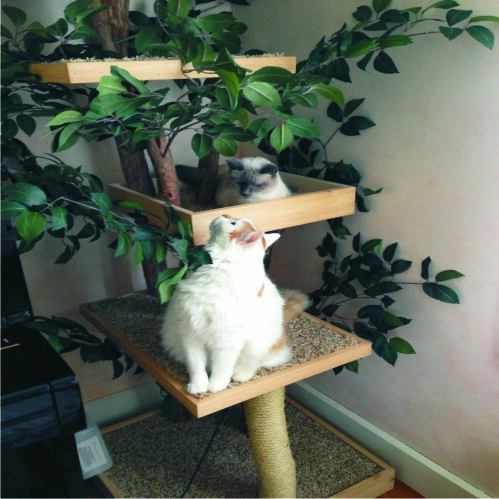 Thank you for such a wonderful cat tree! 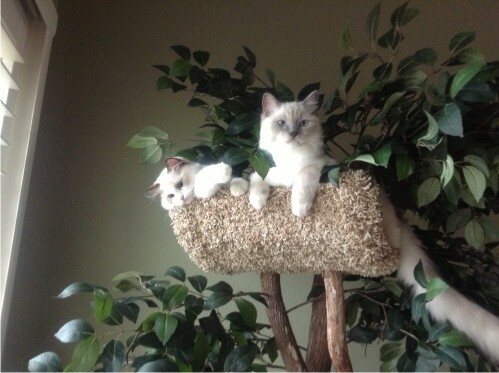 Hakuna and Matata LOVE their nesting tree. I adopted them almost a month ago and from day one they've climbed, jumped, scratched, played and rested on it. 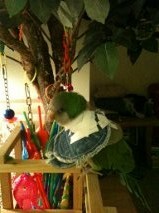 I want to thank you so much for designing a custom Pet Tree House for Tucker, my Quaker Parakeet. Tucker really loves his new tree house. It is so cool. This is where he likes to hang out while I’m working on the computer or watching t.v. The tree house is a beautiful and elegant addition to my living room. I can’t thank you enough for your craftsmanship, creativity, and excellent customer service. The tree’s design fits his needs perfectly. Quaker Parakeets are the only parrot species which build nests in the wild. Although Tucker lives in a condo and doesn’t need to build a nest, he still has his building instincts and likes to stack and rearrange an assortment of building materials, including plastic straws and toys. There’s a little wooden fence, a surface on which he can build and even a little container that holds his building materials. 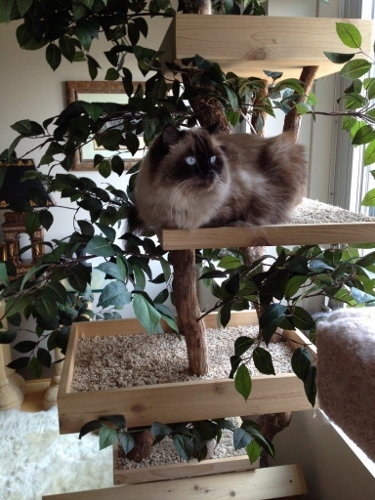 The tree house also gives him a “birds eye view” of the living room, den, and kitchen. I've attached some pictures of Tucker and his tree house, complete with toys and Christmas lights.